A tweet by @IndyGIS drew my attention towards yet to be launched initiative of Esri - Esri Maps for Office. Still there is a caveat as licensing terms are unpredictable. Esri may require one to have ArcGIS desktop license to use the add-in product for Office. This requirement seems unlikely to me. I derive my opinion based on the sole screenshot posted in the landing page. Note the options provided - Insert Map and Basemap. Also in the bottom, the map displayed is from ArcGIS online. Hence, I feel Esri would encourage users to use leverage their online mapping solution, ArcGIS Online instead of taking the traditional route of selling desktop licenses. Encouraging users to use online maps would be a win-win for users and Esri. 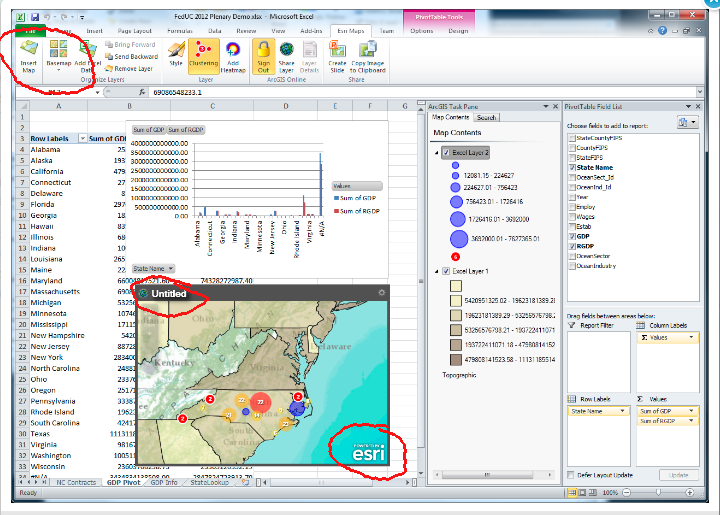 As Esri is trying to target an entirely new crowd who are proficient in Excel but necessarily not in mapping, it certainly won't be wise to expect them to have GIS knowledge. Due to this users will find it hard to learn desktop GIS first and handle data in Excel later. Esri definitely would not want users to take this long route. Now that everyone is familiar with online mapping, thanks to Google Maps and a host of related products, taking the online mapping route would be lot easier. The targeted category of users who look forward to derive new insights of their business trends can have instant and better visualization with access to online maps. Esri would certainly benefit from this release subject to pricing and licensing, as the bottomline is, the number of Microsoft Office users are a lot more than GIS software users. The product is slated for public beta release in the first half of 2012. You can know more here.